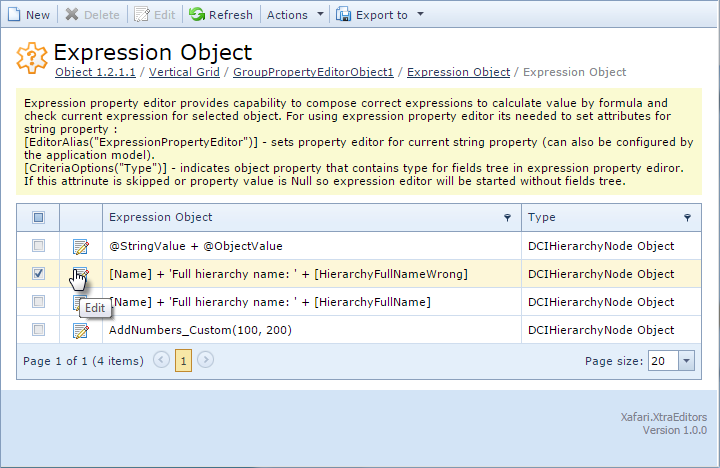 Expression Property Editor allows the user to edit formulas created for different types of objects at runtime. The list of expressions is shown in a special List View. To activate the edit mode, click the Expression Editor Action. The Expression Property Editor appears in a separate popup window. The designer’s workspace contains six areas indicated in the figure below. The first area is intended to output the error messages and debugging results. The respective messages appear after activation of Validate or Debug controls. The second area includes the expression represented by a string of characters. Validate and Debug controls are located on the right side. 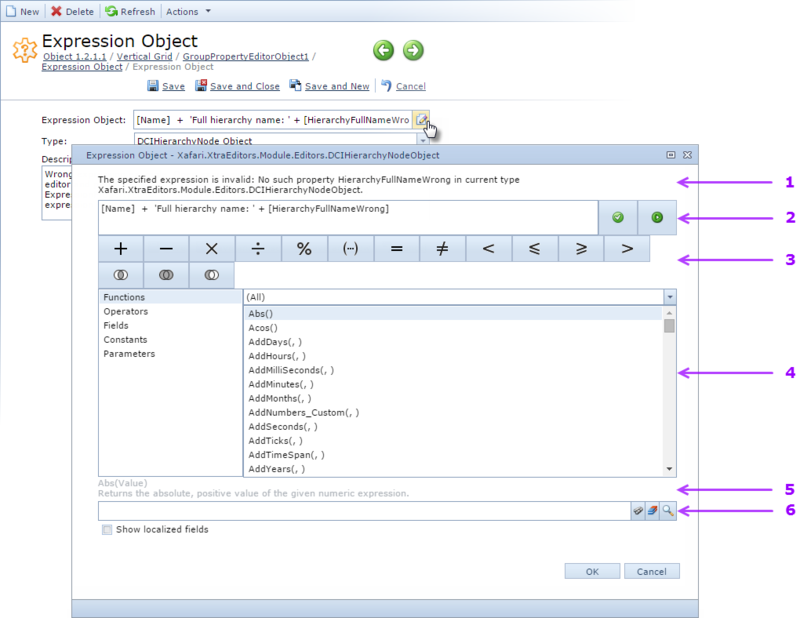 Expression Property Editor provides the editing and debugging functionality both for the entire expression or for the selected part of the expression. Among other things, it checks whether field names are correct. Third area exposes the buttons are used to select the operation. Fourth allows to select the required functions, operators, fields, constants, and parameters. The set of standard functions is complemented with aggregate functions that apply to collections. The developer can add custom functions (see Extend Functionality), including Business Operations, registered in the project. Operators category provides access to the mathematical and logical operators. Fields category provides the metadata tree of the context type. Unlike the XtraReport designer, the tree displays both program names and localized display names. Properties of aggregated objects are also accessible. Constants category provides the constans defined in the application and available to use in expressions. 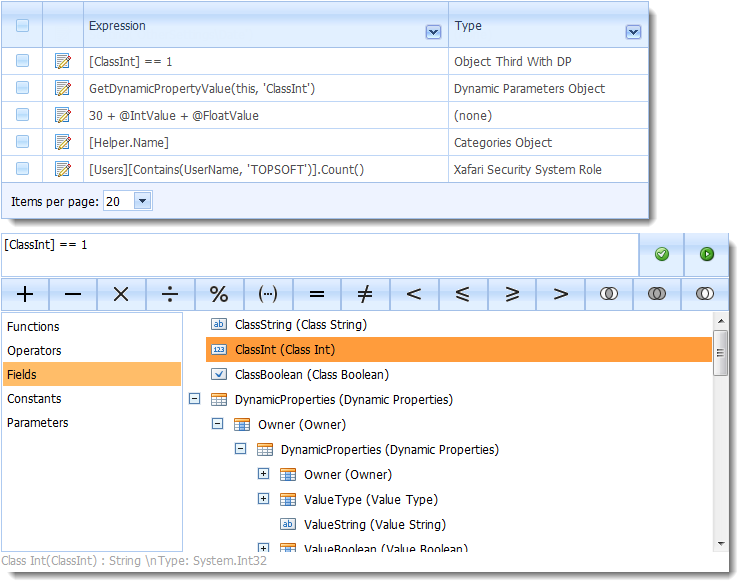 Parameters it is a named values specified in the application and available to use in expressions. Parameters can change their values at different points of operation of the application. Fifth area shows a description of the element selected in the metadata tree (the fourth area). It displays information about the focused element. Find: open the lookup form. Clear: clear the selected value. Open current object view : invoke the object's Detail View in the View mode.